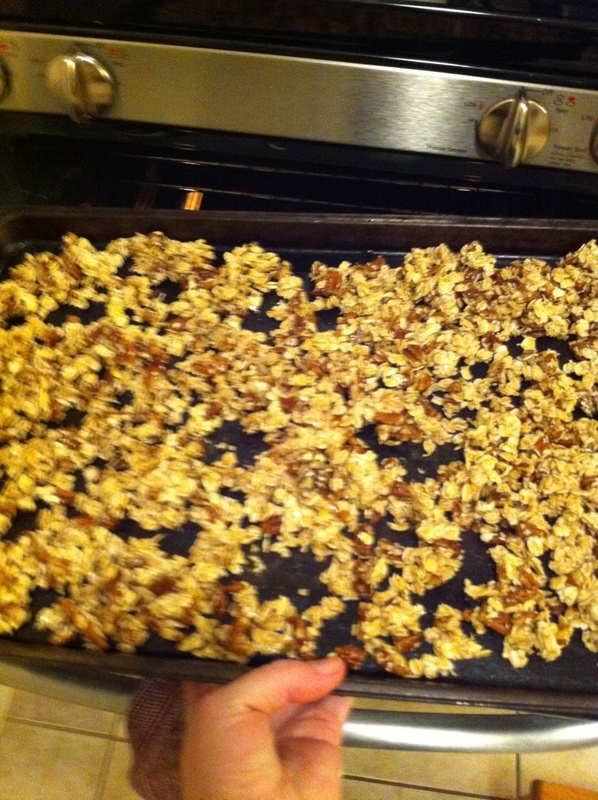 Wild honey+rolled oats+chopped pecans. Bake at 300 degrees until golden, stirring every 10 minutes! I apologize for the awful, awful photo…but the oven was hot and I was trying to balance the tray, take the shot, and avoid making a very sticky mess. 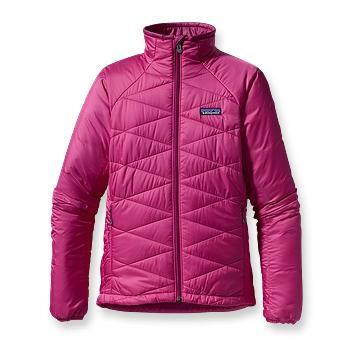 I ran last week’s Love the Run You’re With 5k in my new Patagonia Micro Puff Jacket. While not a “running jacket” per se, I was pleased with the performance and would definitely recommend…especially since Patagonia is now running a 50% off sale on all Fall 2011 gear. I’ll start by saying that the morning was quite cold: about 25 degrees with gusty winds. Patagonia bills the Micro Puff Jacket as a “water-resistant, windproof polyester shell with super warm, highly compressible PrimaLoft® One polyester insulation”, but I have to admit I was skeptical. The jacket is incredibly lightweight and super packable, so it was hard to imagine that it would offer the warmth and wind protection I needed. I was pleasantly surprised. The Micro Puff was warm and provided more than adequate protection against the wind. Though highly breathable, I was most comfortable during the first 2 miles of the race (I unzipped the collar slightly as I was sprinting to the finish line). The jacket includes 2 outer pockets and an inner compartment perfect for an iPhone or credit card/ID. My verdict: the Micro Puff is an excellent 3-season jacket. It’s light enough for moderate activity on cool spring/fall mornings, but offers enough warmth and wind protection to withstand tough winter runs. Plus at $89.50 (that’s 50% off the normal price), it’s a super deal! Happy Running! Once again, Pacers Running shows why it is the local force in race planning and management. 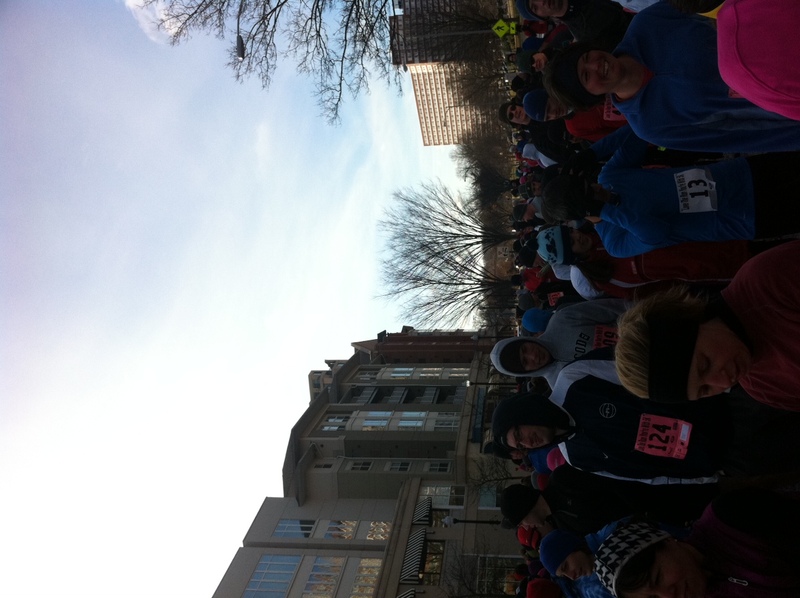 Despite a touch of inclement weather and freezing cold temperatures, today’s race went off without a hitch! The course was cleared of snow and ice, and was well salted before the gun (which, other race organizers should note: went off on time!). Lining up for the Start! This is my second year racing this “down and back” course, so I knew what to expect: a downhill sloping first half, followed by a pretty tedious uphill second half…with a fast flat sprint to the finish. I noticed a number of runners who didn’t anticipate the challenge of the long hill between miles 2-3, and ended up walking or stopping briefly to catch a breath. This course was definitely no joke! If you’re looking for results, click here. I’ve also heard that my favorite local race photographer, SWIM/BIKE/RUN Photography was out snapping shots. Can’t wait to see them! Love the Run You’re With is a Valentine’s Day-themed race, so it was no surprise that there was not one, but TWO engagements at the finish line. Runners getting hitched! How adorable! 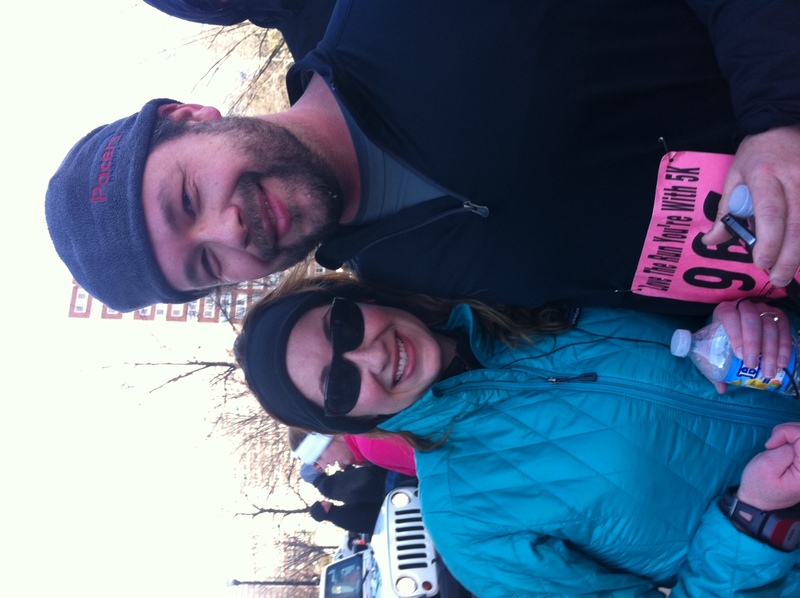 Speaking of relationships, my husband and I celebrated 10 years of being together with this fun 5k. A super way to commemorate the beginning of a great team! And one more thing: I have a ton of race shirts, so it was kinda nice to get something new in the race swag bag: comfy, embroidered, fleece blankies. 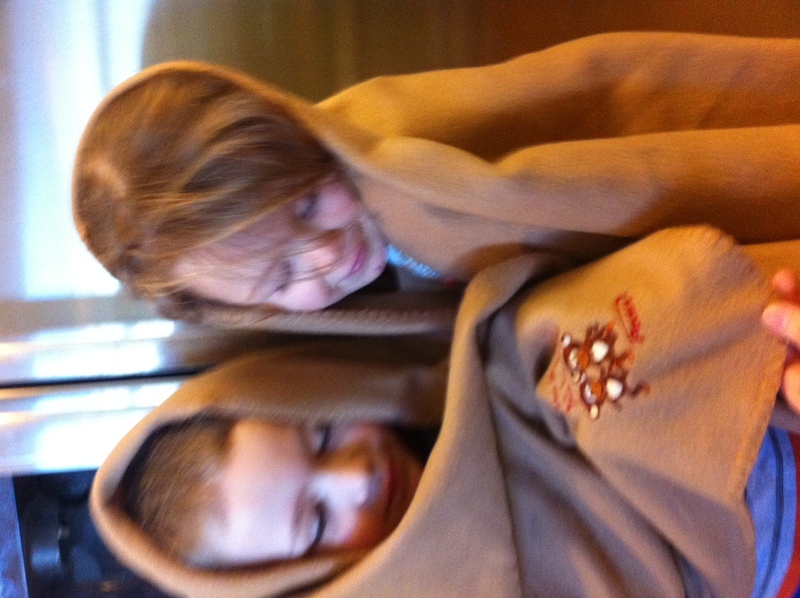 My own little twin monkies got a kick out of race mascots! Got some great news at the doctor’s last week! The latest sonogram showed remarkable (in my words, MIRACULOUS) improvements, so the surgery is off and we’ll continue to monitor status and CA125 levels (which were still a bit elevated) over the next few months. I am absolutely thrilled with this latest development, and would like to thank everyone for the kind words, thoughts, and prayers. This has definitely been a tough time. For those of you who know me personally, you know that I’m an intense worrier…so the combination of alarming news from the doctor, and several hours (alright, days) spent surfing medical websites raised my anxiety levels significantly. Luckily, I’m back to running (still at a reduced rate) and releasing stress. Earlier this week I did a slow and easy 5 miles, taking advantage of the amazing weather in the D.C. area. In anticipation of the Northface Endurance Challenge (scheduled for June), I incorporated a couple miles of trail running into my workout. No need to travel far for a good trail…I simply ran Mt. 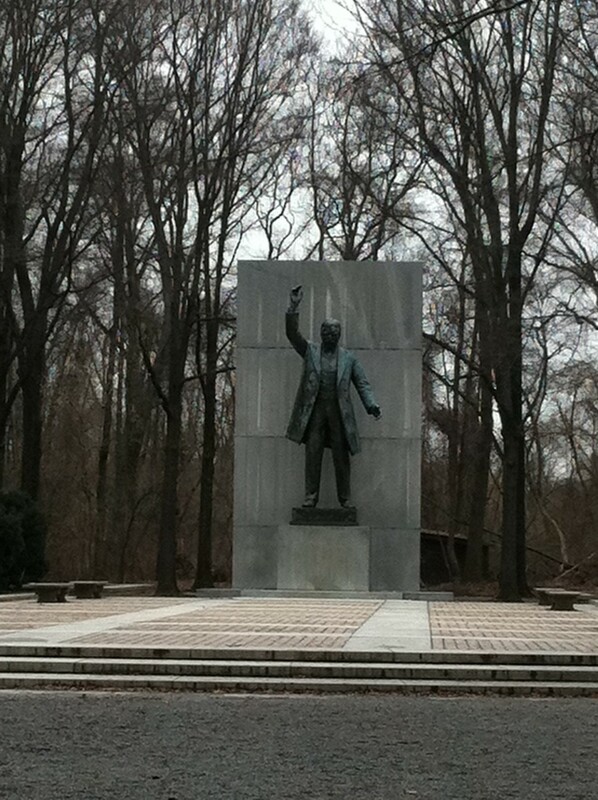 Vernon trail to the Teddy Roosevelt Island and did the large loop. For more information on my route, click here. If you’ve never had a chance to run/tour Roosevelt Island, you’re really missing out. It’s a super little sanctuary in the middle of a big urban area, perfect for running, hiking with the kids, or relaxing with a picnic lunch. We LOVE it! Thanks again for everything, and happy running!